If I had to pick any image to describe my own personal spiritual conversion to Christianity, this would probably be the image. 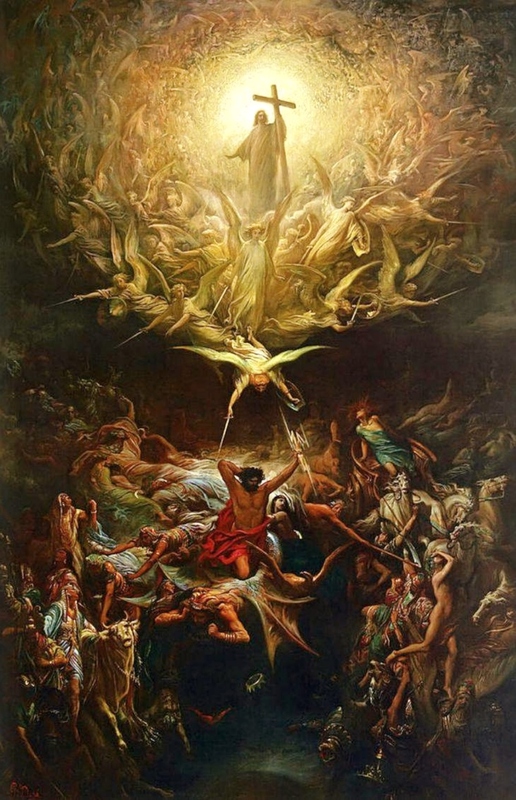 Bathed in ethereal light, Christ stands, victorious, with his armies of angels holding His Christ victoriously. Below him in more earthly tones are gods and goddesses in both human and animal forms fleeing from the angels. Zeus, holding on to his thunderbolt, ducks down to avoid being skewered by an angel. The Triumph of Christianity Over Paganism, by Gustave Doré, c. 1868. Art Gallery of Hamilton, Ontario, Canada. Not that I believed in Paganism, mind you. While I have always been enchanted by Greek mythology, I never believed in it. Greek philosophy, on the other hand? That was another story! Sometime when I was in college, I discovered Greek philosophy, and I couldn’t get enough. I had learned the Socratic method as a math tutor, which made me interested in the man who had created that sort of line of reasoning and questioning. So I started to read Socrates. And I loved it. Then I followed that up with Plato, and then started Aristotle. The ideas were beautiful — the imagery of Plato’s Cave startled me and made me wonder about reality. As a fiction writer, I appreciated Aristotle’s views on crafting stories in his work, Poetics. And of course, Socrates dialogues were entertaining and illuminating as you could get. Furthermore, you didn’t have to actually believe in any sort of religion when reading through these books — often they were just presented as intriguing ideas. At the peak of the Greek philosophers, the religion of the Greeks, while believed, seemed to have been practiced more as a way to keep with tradition and keep order within the populace, while philosophers were allowed free rein to create their ideas and expand on their thoughts. As a college student, this seemed wonderful — after all, wasn’t I in a place that was continually asked me to expand and think about ideas all the time? And then… there was Christianity. While I was raised Catholic, I really struggled with Christianity during my time at college. At university, I studied biochemical engineering, and while nobody actively derided me for my faith, the pursuit of science as a form of truth does make you question the reasonableness of the Christian religion. Furthermore, while I was in a Christian group at college run by a lovely group of Southern Baptists, it was a group that often frustrated me. I was reading Greek philosophy in my spare time and delving into the ideas of all these philosophers, while the oldest book in their library, besides the bible, was written in the nineteenth century. Nor did any of their resources seem to answer some of the deep philosophical questions that I was grappling with in my philosophy readings, which made these contemporary Christian apologetics book seem terribly shallow to me. And then, some of the books in their library flatly refused to acknowledge Catholicism as a Christian religion. I still have a book that this group gave me somewhere in my stacks of books that describes how Latin America has only started to accept Christ — despite the fact that Latin America has been overwhelmingly Catholic for centuries. That really bothered me, because to them I wasn’t Christian. So, when the pastor’s wife challenged us to read something about Christian apologetics from the library so that we could learn about and accept Christ in our lives, I felt a bit rebellious. Instead of choosing an apologetics book from their library, I decided to find a free book as a Kindle by a saint that would challenge me about Christianity so I could decide whether or not it was something that I could align myself with, once and for all, or if Christianity was just a crazy sort of religion that had no rational backing whatsoever. The first book that came up when I looked? Summa Theologica, by St. Thomas Aquinas. Now, let me tell you something about St. Thomas Aquinas. He loves Greek philosophy. His style for Summa Theologica is very much like Aristotle’s work, and in a way that would later be the basis of how a mathematical proof was formed — a detail that I, as a biochemical engineering student, appreciated very much. Not only did he use Aristotle’s style of argument, but he cited Aristotle and Plato constantly and in ways that often blew my mind. He expanded points of Aristotelian philosophy so that I realized that not only was the Christian faith a natural extension of the philosophy, but the Christian faith expanded, illuminated, and enriched the philosophy that I had been exploring. Honestly, it was the perfect book for me at that time when I was truly struggling with the faith. While I never finished all of Summa Theologica (it’s a long book! ), it helped reassure me of the rationality of Christianity and helped me gain a mature perspective of the faith — something that I had been sorely lacking before. And this brought me back to the Catholic faith — this time, for good. So, when I look at this picture, of Christ with His army defeating these Greek idols, I laugh. After all, that’s probably exactly what He looked like when He stormed into my life, using St. Thomas Aquinas’s work as His instrument! Help us develop a mature understanding of You so that we may follow you more joyfully. Enlighten us and walk with us as we explore your friendship and love.